It’s the turn of the century. It’s a summer Sunday in Alsace: there are hours of warm sun to enjoy and friends to meet. Where better for an excursion than St Pilter Mühle, le Moulin de St-Hippolyte? A relaxed six km walk from St-Hippolyte, within an easy stroll from the station, the popular “Brüachmuehl” is a favourite rendezvous for local villagers and the townspeople of Sélestat. The auberge of le Moulin de St-Hippolyte was run by Daniel Oster, succeeded by his son Emile Oster, his wife and their son René. It was situated in the area of small waterways which feed into the river Ill on the fertile plain at the foot of the wine growing corridor. The ancient mill buildings included stables, a barn and an auberge surrounding a courtyard where tables and chairs were always set out. Every Sunday, pleasure-seekers descended on the auberge, gathering with their friends to eat, drink and relax. The cold water of the mill channel was clear enough to swim in and some visitors from Sélestat even arrived by boat. While Madame Oster and René brought out bottles of wine and kept glasses topped up, Emile played his accordion. Some people sang, some danced and the beer flowed liberally. Madame apparently kept the happy crowds in order! It wasn’t only a summer destination. When the waterways and pools froze, Sunday skaters enjoyed heading for le Moulin where they could revitalise themselves with Madame Oster’s vin chaud. It was a venue for all seasons. Nor was its purpose simply pleasure. Harvesting on the ried (the plain) was tough work under the relentless summer sun. During the heyday of manual agriculture, before full mechanisation, farm labourers spent long, exhausting days harvesting an area with little natural shelter. Le Moulin provided essential refreshment, some shade and a place where horses and working cattle plagued by horseflies could shelter, rest and drink. In the bitter winter, the lumberjacks from the Sélestat area arrived to deal with the huge trunks cut from the frozen forests. They used small horses which had exceptional endurance and transported the trunks by wagon to the station of St-Hippolyte where they were despatched up and down the Rhine valley. These workers lodged in the barn of the auberge close to the stables where their little horses rested. The happy times at “Brüachmuehl” ended forever in 1944. 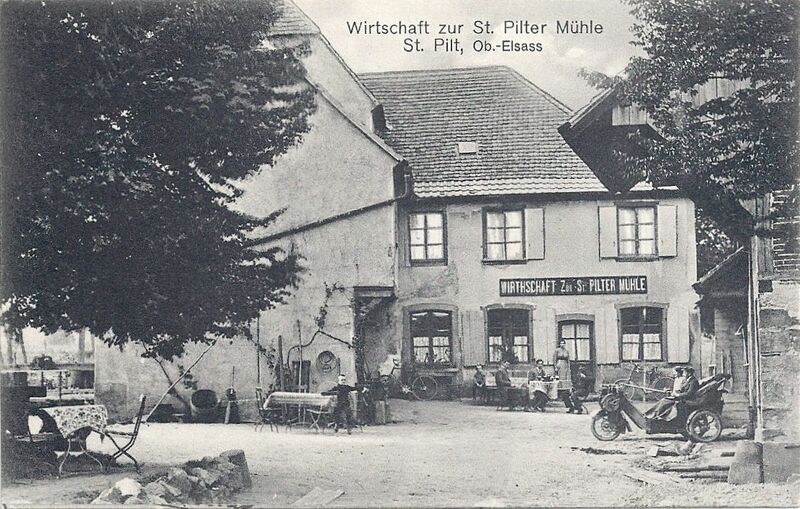 After American troops liberated St-Hippolyte, the Germans defended the plain areas. Emile Oster and his wife sheltered for a few days with a friend’s parents, but, anxious about their livestock, returned to their home. American artillery bombardment entirely destroyed the Moulin de St-Hippolyte, which burned to the ground and Emile and Madame Oster perished with their property. René Oster, their only child, had been forcibly conscripted into the Wehrmacht and captured by the Russians. He had already died in the POW camp of Tambov. … is what remains of that joyful era. 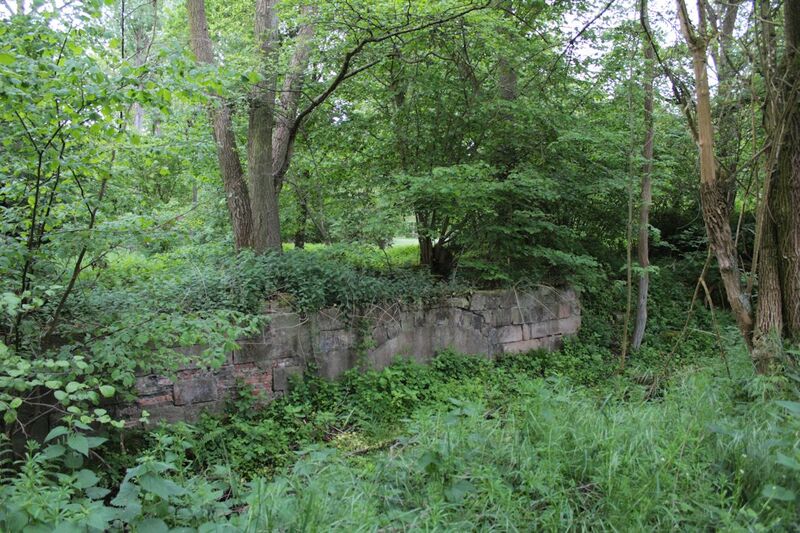 A few stones, part of a pillar, an ancient fruit tree, some burned tiles, some bricks, all now entwined with brambles and weeds. The mill river is overgrown with weeds. If you pause silently and contemplate, you can just about imagine the pleasure of the languid brook, the cobbled courtyard, the dappled shade and the warm sunsets. The atmosphere is charged, still, apprehensive. You might not wish to linger. Travelling north along the RN 83 from Ribeauvillé, leave in the direction of Sélestat at junction 18. 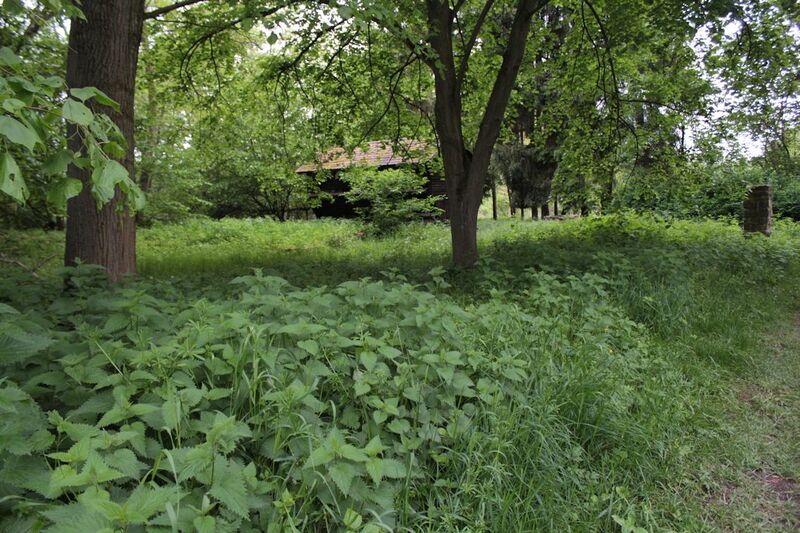 Very soon on your right you come to a ruined former hotel surrounded by trees and undergrowth. Immediately next to this is a small track which takes you to the Léonhart gravel pit. You will soon pass the memorial to Lancaster ND-781 on your left. Park near the gravel pit. Walk straight along the path (with fields on your left) and after about five minutes you will come to the site of St-Pilter Mühle, le Moulin de St-Hippolyte. Alternatively, after you have parked, you can follow the marked trail Sentier d’interprétation Ried Paysan which shows how the landscape has been exploited and preserved, and the impact of human activity on the ecosystem. This takes under two hours at a relaxed pace and you’re sure to see wildlife. Les Cigognes, Bulletin Communal de St-Hippolyte, number 13, 1989, the recollections of Antoine Heyberger whose parents sheltered the Osters during the battle. Postcards and photographs my own. Categories: Environs: countryside, towns and villages, Life and leisure, Touring and tourism | Tags: Alsace, Moulin de St-Hippolyte, Reichsland Elsaß Lothringen, ried, St Pilter Mühle, St-Hippolyte 68, summer Alsace | Permalink. Thank you so much for explaining the story of the MOULIN DE SAINT HYPPOLITE., which I thought was lost for ever. I was thinking about this Moulin tonight, and I was wondering what was this place looking like, and I made a search on google, and I have found your blog by chance. In fact, it was owned by Daniel OSTER who happened to be my grand fathers’ brother. 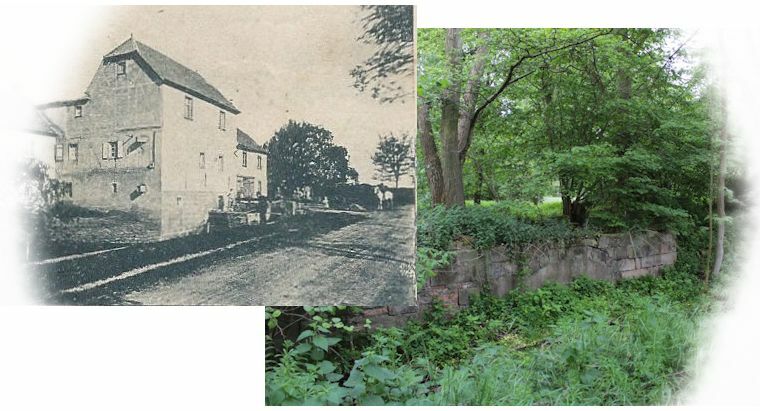 I was very surprised to read the story of my family on your blog, because it’s the first time I read something about them, or even see a photo of the Moulin de Saint HYPPOLITE, which was like a family legend. I can always remember my father talking about the cousins of the MOULIN de SAINT HYPPOLITE, and the joy in his eyes remembering all the good time he had there, with his cousin René. My father who lived in COLMAR used to stay at the Moulin, when he was a boy for his holidays. When he was young, my grand father also played music with his two sisters and they made a little orchestra for dancing and having fun. I did not know that René was a malgré-nous, I thought he had died with his parents in the bombing. As my father died many years ago, I have no more family in ALSACE, I leave in PARIS, so no one could have given me all those details. Well I will keep your nice article, full of emotion, and giving life back to those people, with a kind and respectful eye. I am very happy to send you some photos and a higher resolution scan of the postcards. 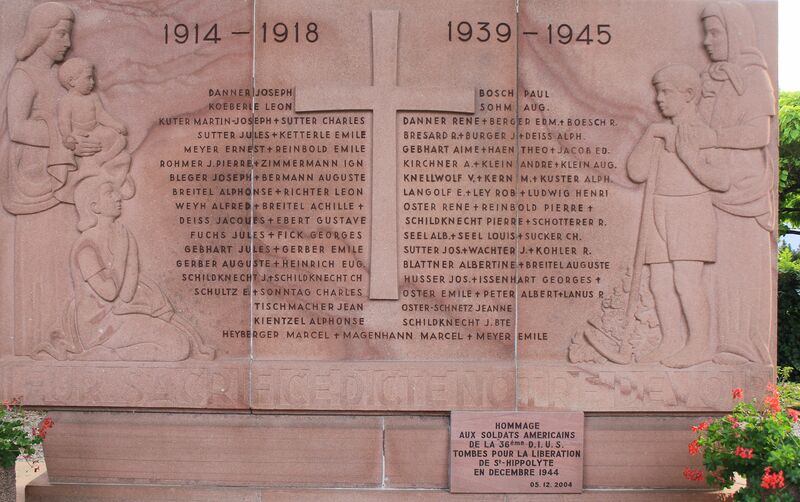 This summer I took a photograph of the war memorial at St-Hippolyte which names the family, if you would like a copy. I intend to add it to my blog soon. We visit St-Hippolyte very regularly and have been doing so for many years, yet it was only this year that we were able to find the remains of the Moulin. Thank you so much for your quick and complete answer! I will be very pleased to receive your photos. You are making a real detective historical work! Are you leaving in Alsace ? you have such a great knowledge about Alsace and the history. I will send some images to the email address you gave when you posted your comments. I’ll start with the old postcards. 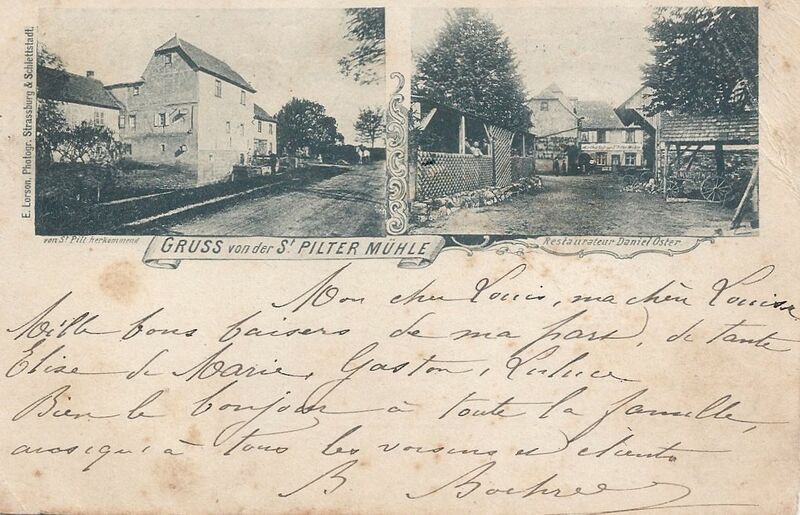 I have a large collection of old postcards of Alsace and the Vosges, including many of St-Hippolyte at the time your relatives lived there. I am always happy to share. No, we don’t live in Alsace (I wish we did!). We have been visiting the area for many years, sometimes several times a year, and love it. We are interested in the 1418 battlefields in the Vosges. There is very little material in English, so I decided to create a blog to share my pleasure in the area and to inform English-speaking readers about the region as it was before 1418 and during the war.